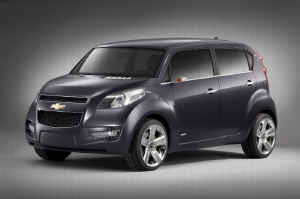 Inspired by a “half-soldier, half-modern” military helmet, the Chevrolet Groove concept is contemporary and funky, but evokes classic Chevrolet heritage design cues like an upright windshield and prominent fender flares that give the Groove a strong, sturdy stance reminiscent of a retro hot rod. Groove lead exterior designer Jawook Koo, of the GM Design Center in Inchon , South Korea , was seeking a mini design that was big on presence. “I wanted to get out of the mini vehicles stereotype that is characterized by a weak, insecure and ‘cute’ appearance, so that consumers can feel safe just by looking at the vehicle,” said Koo. The Groove’s design conveys anything but weakness. The striking matte Lunar Quartz exterior finish contrasts with the strategic use of satin silver exterior chrome details. Big, five-spoke 17-inch wheels pushed all the way to the rear give the impression of a vehicle that’s much longer than it is, thanks to the short-but-pronounced hood and long, flat cabin, a design that provides for a roomy interior. Contrasting Vertigo brake calipers bring additional attention to the big wheels. The front overhang includes open-air vents that are integrated into the front LED fog lamps, and the elongated front headlamps further “lengthen” the vehicle.